Tires have been the talk of F1 so far this season. For whatever reason, each week the tires seem to degrade faster and faster. This week, the soft tires would last maybe six laps before a massive performance drop off. But two people were able to take advantage of the tire. And those people were Fernando Alonso and Sebastian Vettel. Kimi Raikkonen made a slow getaway from second on the grid, which allowed both Ferraris to slide by into second and third. Polesitter Lewis Hamilton held the lead for the first five laps, but he couldn't keep the squadron of Ferraris behind. Alonso and Massa slipped through on lap five and left Hamilton behind. The Ferraris, like nearly every other car in the top ten, started the race on the weak soft tire. And when I say weak, I mean pit stops started in the first ten laps because the tires just became unusable. Full tanks and extra weight meant that the degradation of the soft rubber was just incredible. And that brought Hulkenberg, Vettel, and Button to the front, because they started on the medium rubber. And big ups to Hulkenberg, he kept Vettel behind without blocking. Too bad his pit stop was three seconds slower than Vettel's, that's basically an eternity in F1 and sent him down the order. Mark Webber, who suffered from fuel issues in qualifying yesterday and started last, made his first pit stop on lap one to switch to the medium tire. This little strategic move meant that he could theoretically finish the race on two more stops for the desirable and longer lasting medium compound tire. And it was going well, Webber worked his way into the points and looked set for a good finish after a disappointing Saturday. But, if Mark Webber didn't have bad luck, he'd have no luck at all. And on lap 15 he got together with Toro Rosso driver Jean-Eric Vergne, breaking his front wing and forcing an early second pit stop. And the pit stop wasn't perfect, as the right rear wheel wasn't properly fastened. It fell off in the hairpin, nearly hit Sebastian Vettel, and left Webber to walk home, pointless again. Adding insult to injury, Red Bull have been fined 5,000 euro for the incident. On the track, McLaren new boy Sergio Perez didn't do himself any favors or make any friends. He made some moves that were definite blocks, while others seemed like he didn't realize cars were on the track. On lap 16 he squeezed Kimi Raikkonen onto the grass, which made Raikkonen hit the back of Perez, damaging the nose cone. It wasn't exactly the best race for Mexican drivers, as Sauber's Esteban Gutierrez made a bit of a rookie mistake and ran right into Adrian Sutil at the end of the long straight heading into turn 14, which took both out of the race. Sutil's teammate Paul di Resta probably wasn't too upset about this, since Sutil took di Resta off the track just a few laps earlier. But at this point, the race started to come to Fernando Alonso. Freddie made two very clever passes for the lead on Hulkenberg and Vettel in the middle of turn 13, which allowed him to activate his DRS system down the straight and extend his lead, after he had already made the pass. Brilliant stuff, and that's how you win two championships. This left Alonso out front to cruise to victory, but the battle was for the rest of the podium. Sebastian Vettel made a final pit stop in the closing laps to put on the awful soft tires. The tires that shred to pieces in just a matter of laps. That sent him to fourth, about 12 seconds behind Raikkonen and Hamilton. But Vettel smelled blood, and he went for it. He started clicking off laps that were four seconds faster than Hamilton, true qualifying style laps like what we used to see from Michael Schumacher. Heading into the final lap, Hamilton was caught in traffic behind Charles Pic's Caterham while Vettel had cut the gap to just two seconds. At one point, just before the DRS zone on the back stretch, it seemed that Vettel was going to get by. But two small mistakes as he got close pushed him too far back to capitalize on the opportunity, letting Hamilton keep third by just three tenths of a second. But Alonso came out on top. A supreme job managing his tires along with some excellent passes put him right back into the championship hunt. It's still anyone's championship. The talk after the race has to be the Pirelli tires. The insane degradation left marbles all over the track. Alonso and Raikkonen were apparently saying unkind things about the tires to each other on the podium, because when David Coulthard asked them to say it over the speakers, they said they couldn't. Stewards were also investigating a number of cars for using their DRS wings under caution, but decided to issue no penalties. Sounds like it was a malfunction with the whole system, not the cars. 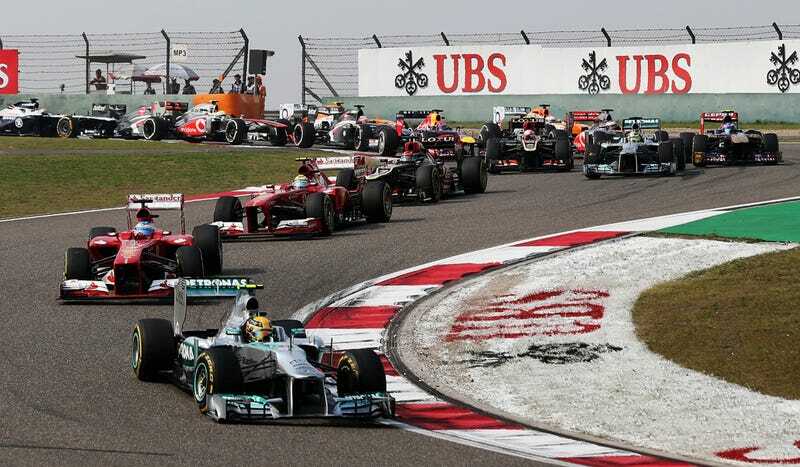 F1 returns next weekend for the always controversial Bahrain Grand Prix.